These conditions can negatively affect a person’s self-esteem, relationships, sense of connection to others, and the ability to work, study and participate in enjoyable activities. The ability to participate in these important aspects of life can be referred to as “recovery”. We are seeking people aged 18+ who have past or current experience of anxiety to participate in an anonymous online survey. This survey asks about your anxiety symptoms and what RECOVERY from anxiety means to you. It will take 25-30 minutes to complete. Do you experience frequent panic attacks? Worry about having a panic attack? Or avoid situations due to fear of having strong physical symptoms of anxiety? Researchers at the UNSW and St Vincent’s Hospital are evaluating an online course for panic disorder and/or agoraphobia. It contains 6 lessons of CBT delivered via the internet over 8 weeks, with support available from mental health clinicians via phone or email. The course is self‐paced and can be completed from the comfort of your home! How does depression influence the processing of emotion? Researchers at the School of Psychological Sciences, Monash University are looking for individuals who are currently experiencing depression to take part in a study. The research involves attending a session at Monash University (Clayton) which include a brief interview followed by the completion of questionnaires and computer tasks. The session will take about 2 hours. Participants must be aged between 18 and 60 years and must not have a diagnosis of substance dependence, a history of psychosis, or an organic brain injury. Participants will be offered $30 to thank them for their time. Is Shyness or Social Anxiety a problem for you? Do you fear social situations? (e.g., meeting new people, social gatherings, and public speaking) Are you diagnosed with Social Phobia or Social Anxiety Disorder, or think you may suffer from these? Do you or someone you know with social anxiety want to participate in research into the experience of Social Anxiety? Then this project may interest you! Click here for further information. Participation is voluntary and you can withdraw at any time. You will be reimbursed for your time and effort: $150 at the completion of the study. Total time commitment is approx 4 hours. Researchers at Swinburn University are seeking individuals 18 years or older to participate in an online questionnaire. Responses will help to better understand how thinking patterns impact upon gastrointestinal discomfort. Participation will also help to evaluate the study's new scale against other similar scales that assess cognitive processes associated with bowel discomfort. Validation of the new scale will lead to better ways to measure and assess common cognitive factors associated with bowel discomfort. Participants are welcome to enter a draw to win one of four $100 Amazon.com gift vouchers. Have you ever wondered whether your gut bacteria (and gut health) is associated with your mental and physical health? Researchers at the University of Melbourne are conducting a study to find out! Between 18-40 years of age? Living in Greater Melbourne or Geelong (or willing to travel)? Fluent in written and spoken English? A non-smoker, or irregular smoker? Never been diagnosed with a depressive &/or anxiety disorder or irritable bowel syndrome? Interested in taking part in an exciting new study investigating the association between bacteria, mental and physical health? 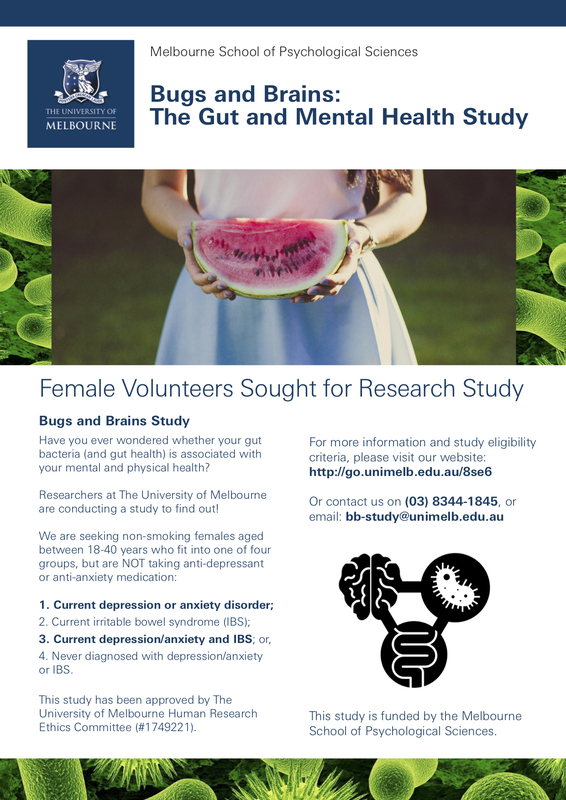 If you answered yes to all these questions, and would like more information about the study and eligibility details, please visit www.psychologicalsciences.unimelb.edu.au/research/bugs-and-brain or contact us on (03) 8344 1845 or bb-study@unimelb.edu.au. Do you feel uncomfortable using public toilets or experience fear of incontinence in public? We are interested in learning more about toilet anxiety (also known as shy bladder or shy bowel, and paruresis or parcopresis) and fear of incontinence (also known as bladder and bowel incontinence phobia. Toilet anxiety involves feeling uncomfortable using public toilets despite feeling comfortable using a toilet at home, while fear of incontinence refers to the overwhelming fear of incontinence in the absence of a medically diagnosed bladder or bowel condition. This project involves exploring how attitudes about oneself, cognitive processes (unhelpful thoughts), social-cognitive processes (positive and negative evaluations) and social anxiety, relate to toilet anxiety and fear of incontinence. Your answers to this questionnaire will help inform mental health professionals to offer support to individuals with toilet anxiety and/or fear of incontinence. During this online study you will be asked questions about common (yet uncomfortable) experiences that individuals may have in public toilets and in social situations. This study will take no longer than 40-60 minutes to complete. Anyone over the age of 18 is eligible to participate in the study.